Wartime Women, edited by Dorothy Sheridan, is a Mass-Observation anthology. It examines how the war affected the lives of women. So much changed for women during the war years. Many of their husbands were gone, they were working outside the home, even the attitude towards women entering pubs changed. This book examines the changes, many times using the women's own words to give a clear picture of the world they lived in and what they thought of it. I have read quite a few Mass-Observation based books and this one is a little different. Many of the others use diary extracts to paint a picture of the world, frequently following a few individuals. This book quoted from diaries, but it also used reports written on concerns of the day and observations sent in to "directives" issued. These directives were basically questionnaires used to collect information on various subjects. These reports and directives discussed everything from driving in London to the demand for day nurseries to opinions on women in public houses. The diaries are fascinating to read but sometimes they assume you have knowledge common to the day. The reports fill in some of these gaps. "I listened and heard machine-gun fire, lay in bed and listened and heard burst after burst of guns. This was about eight o'clock. Mother called out, 'Do you think they are landing on the beach?' She then said, 'If they come I shall get under the bed and lie low.' Jenny said, 'I think I shall be more of a success with them if I stay in bed!' We all laughed and after a time it stopped and I went to sleep again." It isn't the world's best joke but it gives such a clear image of the women and their relationships and how they coped. I marked another example of the same type of reaction. "Mrs B. was telling me that when the Belgians gave in she felt terrible-she felt like sitting down and weeping her heart out. Then she started to plan what she had better do if we were invaded-for she was certain we would be invaded right away and she planned that she and Mrs M. would take the old car, pile all the kids into it and get away-and when she came to think of the old car starting off all piled up with bedding and kids it struck her as so funny that she sat down and had a good laugh-and that was that." "And that was that." Fear, sorrow, weeping, planning, laughter, "and that was that" and they all got on with it. I think that is what is so amazing. Lives were changing, attitudes were changing, the world was crashing all around them, but "that was that." This book collected information from a huge range of women of various ages all living in wildly different circumstances. 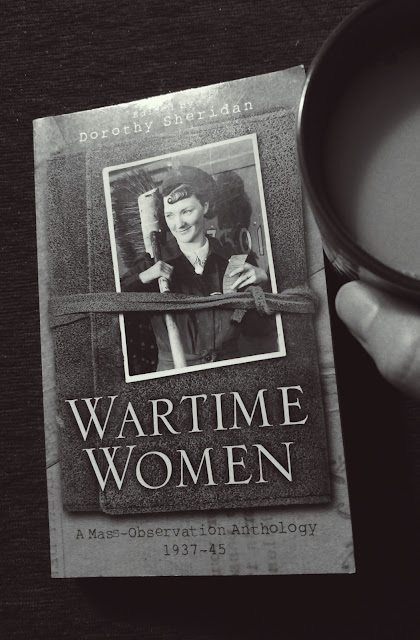 The whole thing comes together to give a fascinating picture of women's lives and attitudes during WWII.